A student named this project. I wanted a way to treasure all the amazing things in our world. We were inspired by the many leaves turning colors and falling this time of year. 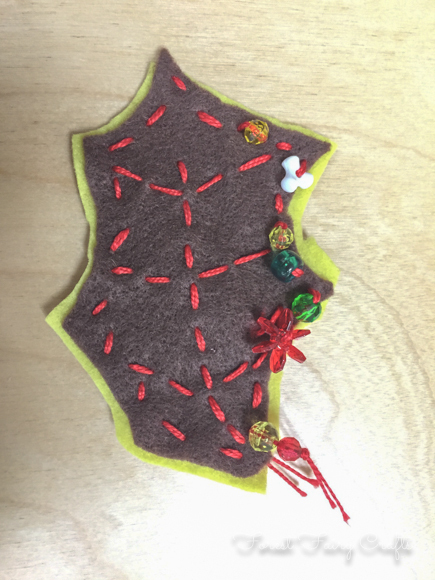 What if we could sew a leaf where students could collect gratitude inside on slips of paper? The leaf can become a decoration with a surprise. Students decided they might add gratitudes before Thanksgiving to share on the day. Or they might go around on Thanksgiving and ask everyone to add a gratitude on a little piece of paper to keep inside the leaf. Either way, they discovered these are the perfect way to 'Leaf' a gratitude! I cut paper with this second/third grade class a lot. I hoped we could make the leap into felt (saving me a ton of prep time). So I brought in rectangles of brown felt. We talked about shapes of leaves and "cutting out" triangles or curves to create a leaf. Students often want to "cut around", twisting the felt and cutting things in half accidentally. We had mixed success. A few needed a second piece of felt, or the leaf was super-small, or not what they expected. We worked through the hiccups. We talked about decorating one side of the felt. I did show them how to stitch so they could to embroider the veins of the leaves if they wanted. They all looked beautiful in their own way. Students chose the color for the back of the leaf. At home, I cut the chosen felt bigger than the leaf. I made it roughly similar, but did not meticulously cut the felt to match. This way, if it wiggled, they had room to keep sewing. 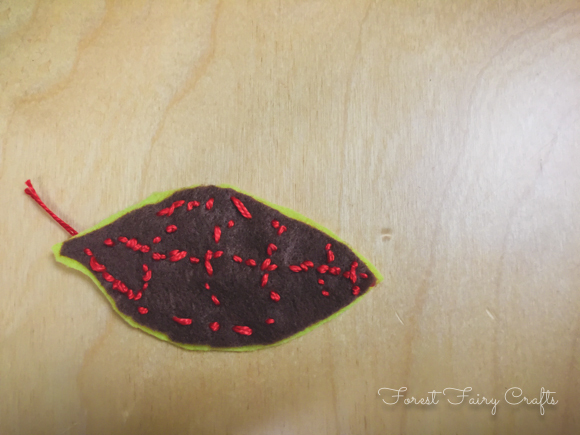 For the next class, we talked about sewing up and down (running stitch) and traveling around the edge of the brown leaf like a little caterpillar. "Leave a gap," I said, "So your leaf has a secret compartment for gratitudes." They could add beads and sequins as they travelled around. Each leaf became lovely. We tied loose ends and children promptly planned how they would surprise their family with gratutides in the pocket. A few plan to add it to the Thanksgiving table. A few want to add a loop to hang their leaf. Lots of ideas. Which is my favorite kind of project. A craft that inspires! You can see the little gap on this leaf- a space without stiching so you can get inside the leaf.